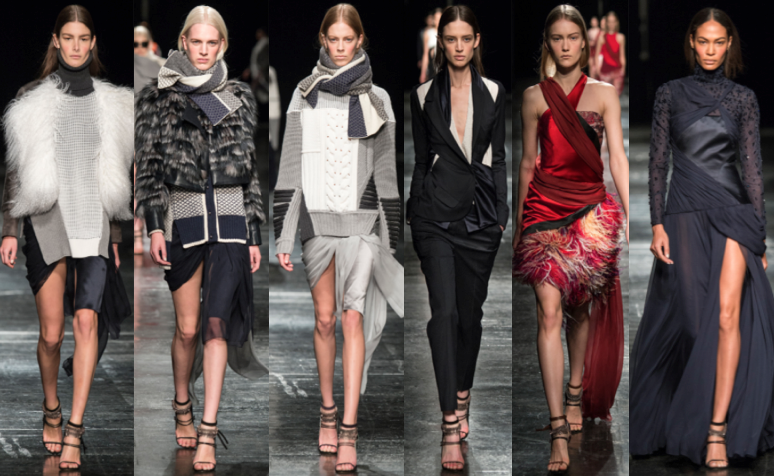 There have been some major updates since we exclusively pointed out the similarities between Prabal Gurung's Fall/Winter 2014 collection and Indonesia-based designer Priyo Oktaviano's Fall/Winter 2015 collection. On the heels of our report, Dewi magazine, the company that sponsored Oktaviano's F/W runway show during Jakarta Fashion Week as part of its Fashion Knights 2014 program announced that Oktaviano had resigned as one of the company's official sponsorees for 2014. The Dewi Fashion Knights (DFK) program is an incubator-style initiative aimed at fostering the careers of young designers in Indonesia. In a statement, the company said: "We honor and respect the decision for the good of the Indonesian fashion industry." Moreover, Oktaviano gave a statement to Indonesian website, Wolipop, saying: “At first glance, the design of the two are quite similar in terms of techniques, silhouettes and stitches. Just different from the selection of colors and couture details are used, like a game of sequins and feathers.” He further states: “I cannot give more information on this. Thank you." Given Oktaviano's resignation from the DFK program, we can only assume the copycat collection will not be produced for sale. Gurung's collection, however, is available for sale at mytheresa.com, modaoperandi.com and Barneys.